The page area. The page area includes the boxes laid out on that page. The edges of the first page area establish the rectangle that is the initial containing block of the document. The canvas background is painted within and covers the page area. The margin area, which surrounds the page area. The page margin area is transparent. When formatting content in the page model, some content may end up outside the current page box. For example, an element whose 'white-space' property has the value 'pre' may generate a box that is wider than the page box. As another example, when boxes are positioned absolutely or relatively, they may end up in "inconvenient" locations. 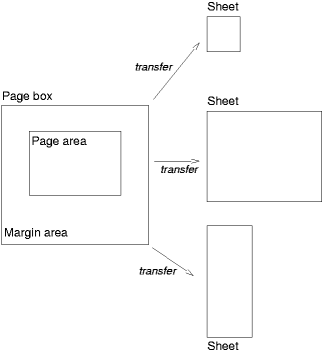 For example, images may be placed on the edge of the page box or 100,000 meters below the page box. User agents should avoid generating a large number of empty page boxes to honor the positioning of elements (e.g., you do not want to print 100 blank pages). The 'orphans' property specifies the minimum number of lines in a block element that must be left at the bottom of a page. The 'widows' property specifies the minimum number of lines in a block element that must be left at the top of a page. Examples of how they are used to control page breaks are given below. Only positive values are allowed. In the vertical margin between block boxes. When an unforced page break occurs here, the used values of the relevant 'margin-top' and 'margin-bottom' properties are set to '0'. When a forced page break occurs here, the used value of the relevant 'margin-bottom' property is set to '0'; the relevant 'margin-top' used value may either be set to '0' or retained. Note: It is expected that CSS3 will specify that the relevant 'margin-top' applies (i.e., is not set to '0') after a forced page break. Rule B: However, if all of them are 'auto' and a common ancestor of all the elements has a 'page-break-inside' value of 'avoid', then breaking here is not allowed. Rule D: In addition, breaking at (2) or (3) is allowed only if the 'page-break-inside' property of the element and all its ancestors is 'auto'. If the above does not provide enough break points to keep content from overflowing the page boxes, then rules A, B and D are dropped in order to find additional breakpoints. Make all pages that do not end with a forced break appear to have about the same height.